I briefly passed through London to pick up my flight back down under and was lucky to catch up with a number of friends from school and work who are based over here. 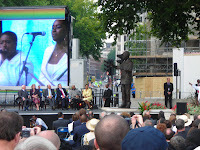 As an added bonus Nelson Mandela was in town to attend the unveiling and dedication of a stature in parliament square alongside Churchill and Roosevelt. It was a great little event with the mayor Ken Livingston and Prime Minister Gordon Brown also along for the photo opportunity. Mandela was strong in voice but very frail in body, so I was glad to have got my chance to lay eyes on a legend. France is a wonderfully beautiful country with many different landscapes and a seemingly endless supply of picturesque tilled villages and grand chateaux and castles. I was very lucky to visit so many different fantastic places in a short time. 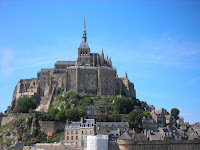 Some of my favorites included the grand bulk of Chambord with its double helix central staircase, the burial site of Leonardo De Vinci, and the ruins lit by the evening light of one of King Richard’s castles, my childhood hero, and of course the legendary San Michael perched on its rocky outcrop surrounded by the sea on all sides. With a bike at my side I managed to get in some of the sights and sounds of a few of the big cities of Euorpe. 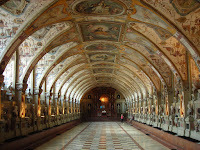 First up was Munich which was surprisingly enjoyable with a wonderful pedestrian centre, and plenty of museums and things to see and do. I wished I’d allowed more time for exploring the mountains and valleys of the Barvian Alps though, which looked like an excellent playground. It was then onto Prague with its fascinating post soviet history as well as castles, palaces, towers and of course the wonderful medieval Charles Bridge. It did however also have cobble stones on the streets, which look wonderful and lend great character to a city, but are hell to try and ride a bike on!